If you are new to office 365 or are not aware of this, editing documents simultaneously is a great feature and surprisingly easy to use. You may be used to collaborating on documents using Office on your desktop with the files stored on shares but one of the problems in the older versions of Office was documents being locked for editing by other users. Of course if you require documents to be locked for editing, you can enable checking in and checking out of documents to get the same effect in office 365, however working collaboratively on documents now doesn’t mean you accidently save over the other persons work. Parts of the document lock to allow you to see what the other collaborators are doing in the document. This feature is available in Word, PowerPoint, Excel and OneNote files. It’s a really exciting way to collaborate and makes working in groups much quicker than having to edit the document one by one. As a teacher you could be working on a documents together as a department rather than passing around marksheets or assessment data for each teacher to enter one at a time. It’s also great for businesses having to work on long documents which require collaboration such as proposals. My video below demonstrates the functionality. This entry was posted in Education News, Office 365, SharePoint 2013, SharePoint in Education, SharePoint News, SharePoint Online, SharePoint Online Permissions, Tony Phillips and tagged Cloud Design Box, Derby, Derbyshire, Hull, Office 365, Office Online, Office Web Apps, SharePoint, SharePoint 2013, SharePoint Consultancy, SharePoint Online, SharePoint Tony, Tony is here, Tony Phillips, tony phillips derby, Tony Phillips Hull, Tony Phillips SharePoint on March 9, 2016 by Tony Phillips. The following PowerShell scripts were created to enable me to deploy a custom navigation across multiple site collections. You can use managed metadata navigation as mentioned in my previous post. Unfortunately this method doesn’t allow the user to reuse managed metadata navigation across multiple site collections (no idea why, I thought that was one of the advantages of managed metadata navigation!). So a new and clean way of doing this is to use the CSOM for PowerShell. The code below deletes every navigation node using the first function and then adds each item added to an XML file. A strength of using this method is it can be manipulated to add additional logic for adding links to particular site collections depending on the variables in the XML file. Hope you find this useful. For SharePoint design, workflows, automation, training and support please visit my SharePoint consultancy site www.clouddesignbox.co.uk. We offer education and business SharePoint solutions and services. 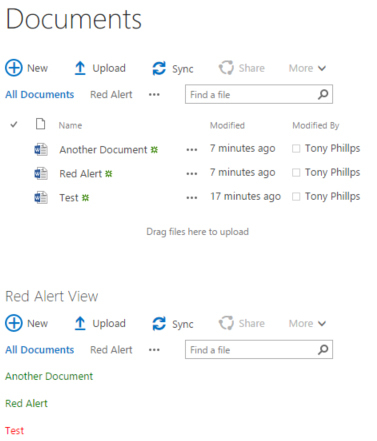 This entry was posted in Office 365, PowerShell, SharePoint 2013, SharePoint News, SharePoint Online, SharePoint Online Permissions, Tony Phillips and tagged Client Object Model, Client Object Model PowerShell, Cloud Design Box, Codnor, CSOM, Derby, Derbyshire, Design, Hull, Nottingham, Office 365, Office Online, Office Web Apps, Office365, PowerShell, PowerShell CSOM, SharePoint, SharePoint 2010, SharePoint 2013, SharePoint Consultancy, SharePoint Design, SharePoint Online PowerShell, SharePoint Tony, Tony, Tony is here, Tony Phillips, tony phillips derby, Tony Phillips Hull, Tony Phillips SharePoint, UK on March 9, 2016 by Tony Phillips. However if I want to loop through the menu and delete all the nodes, the above function errors as the array has changed each time it loops, the method below works but doesn’t catch all the menu items. As we are enumerating the nodes, we are removing nodes from the start and changing the position of the other nodes in the array. As the loop continues to run, it can skip positions of some of the nodes. A solution which works better is looping through the array backwards. As you loop through the array backwards, it doesn’t change the position of items still in the array. Hope you may find this useful, it can be difficult to find why the loop misses some random items and hopefully looping backwards will avoid any issues like this. This entry was posted in Office 365, PowerShell, SharePoint 2013, SharePoint News, SharePoint Online, SharePoint Online Permissions, Tony Phillips and tagged Cloud Design Box, Codnor, CSOM, Derby, Derbyshire, Hull, Navigation, Nottingham, Office Online, Office365, Phillips, PowerShell, SharePoint, SharePoint 2010, SharePoint 2013, SharePoint Consultancy, SharePoint Design, SharePoint Online, SharePoint Tony, Tony, Tony is here, Tony Phillips, tony phillips derby, Tony Phillips Hull, Tony Phillips SharePoint, UK on March 7, 2016 by Tony Phillips. With the rise of Office 365 and SharePoint online, the ancient practice of using a custom master page to brand a SharePoint site is coming to an end. SharePoint online has many incremental changes, bug fixes and improvements to the Seattle master page meaning that if you have taken a copy of this Master Page to apply your branding, you could be missing out on the constant evolution of SharePoint online. Custom Master Pages can still be used but Microsoft recommend against this now. The good news is that we can make exactly the same branding changes without having to use a custom master page. I will briefly mention that you can create themes for SharePoint very quickly using Microsoft’s free tool which can be downloaded from here. Great for quick colour palettes and background images but not great if you want a responsive or more custom design. A link to a custom CSS file is recommended for advanced branding changes. This won’t affect any improvements to the default Seattle master page however you may need to update the CSS from time to time to reflect any interface changes. The alternative CSS link can be set via the GUI on a publishing site or by CSOM on any site. You can use the same objects to remove all the custom actions and list them. You can find out more information and the C# examples here. Although this is a different way of thinking about branding, in the long run, it’s cleaner and more reusable than custom master pages. Your customers will have a better experience in Office 365 but even CSS and DOM manipulation may need updating as SharePoint evolves. Some really useful examples and more detailed explanations can be found on Vesa Juvonen’s Ignite talk. In Vesa’s example he uses Visual Studio and Apps to deploy the CSS and JS. I’m often asked about restoring deleted documents, where the recycle bins are and how long they are kept there for. Hope this post will be of use to some of you. SharePoint’s powerful document management features provide the end user and administrator ways of recovering deleted items. Items can be deleted accidentally (sometimes without the end user even knowing). Luckily we can go into SharePoint and recover the document before it is lost forever. When a document is first deleted, it goes into the end user recycle bin on the site. The user deleting the item has several days (93 days by default in SharePoint Online) to recover the item themselves. After that period (or if the item is deleted from the site recycle bin) it then goes into the second-stage recycle bin. The second-stage recycle bin is only accessible by the site collection administrator. There is then another 93 days to recover the item before it is deleted forever! Items in the second-stage recycle bin don’t count towards your site collection quota but items will automatically be deleted if you exceed 200% of your site collection quota (which is unlikely if you make sure your site collection has 1TB of storage). I’ve created the video below to explain the recovery process from both recycle bins. A great way to find those missing documents which were accidentally deleted by the end user. More information can be found here on the Microsoft website. This entry was posted in Office 365, Recycle Bin, SharePoint 2013, SharePoint in Education, SharePoint News, SharePoint Online, SharePoint Online Permissions, Tony Phillips and tagged Cloud Design Box, Codnor, Derby, Derbyshire, Hull, Nottingham, Office 365, Office Online, Office365, Phillips, Recover documents, Recycle bin, SharePoint, SharePoint 2010, SharePoint 2013, SharePoint Consultancy, SharePoint Design, SharePoint Online, SharePoint Tony, Tony, Tony is here, Tony Phillips, tony phillips derby, Tony Phillips Hull, Tony Phillips SharePoint, UK on January 27, 2016 by Tony Phillips. I’ve made a quick video guide on how to set-up Azure Connect (DirSync) to sync with Office 365. It’s done using a simple demo environment and I suspect that you may find complications and other errors when trying this out in a production live environment. Hopefully this is of use to you (even if it just makes it seem less scary!). I will try to get chance to write up this blog post in more detail rather than just the video at some point in the future. This entry was posted in DirSync, Office 365, PowerShell, SharePoint in Education, SharePoint Online, Tony Phillips and tagged Active Directory, Azure, Azure AD, Azure Connect, Cloud Design Box, Derby, Derbyshire, DirSync, Education, Hull, Nottingham, Office 365, Office Online, Office365, Phillips, PowerShell, SharePoint, SharePoint Consultancy, SharePoint Tony, Tony, Tony is here, Tony Phillips, tony phillips derby, Tony Phillips Hull, Tony Phillips SharePoint, UK on December 15, 2015 by Tony Phillips. When troubleshooting DirSync issues with Office 365, it is sometimes difficult to know if the DirSync successfully applied to Office 365. 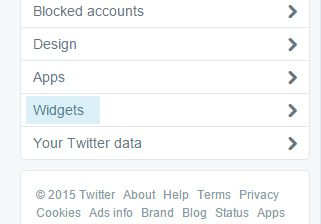 There is a quick way to check this and it provides the data for when the update last took place. 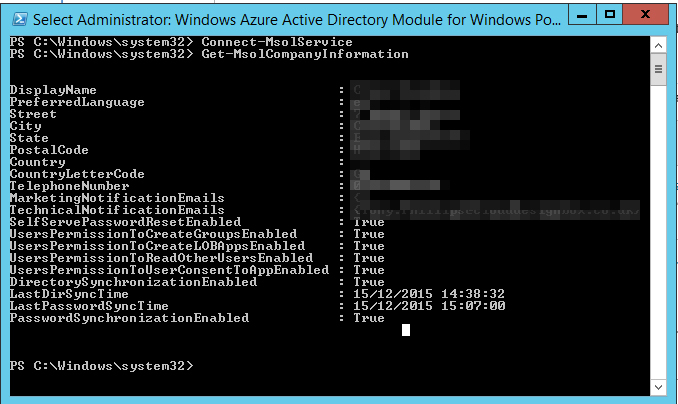 First you will need to make sure that you have installed the Azure AD Module for PowerShell, you can download from here. When this has installed, run Connect-MsolService to connect to the Office 365 tenancy, this should be a global administrator account. This entry was posted in DirSync, Office 365, PowerShell, SharePoint in Education, SharePoint Online Permissions, Tony Phillips and tagged Active Directory, Azure Connect, Cloud Design Box, Codnor, Derby, Derbyshire, DirSync, Education, Hull, Nottingham, Office 365, Office Online, Office365, Phillips, PowerShell, SharePoint, SharePoint Consultancy, SharePoint Online, SharePoint Tony, Tony, Tony is here, Tony Phillips, tony phillips derby, Tony Phillips Hull, Tony Phillips SharePoint, UK on December 15, 2015 by Tony Phillips. Many schools and businesses are using twitter as a social communication platform to send out news and information to users. 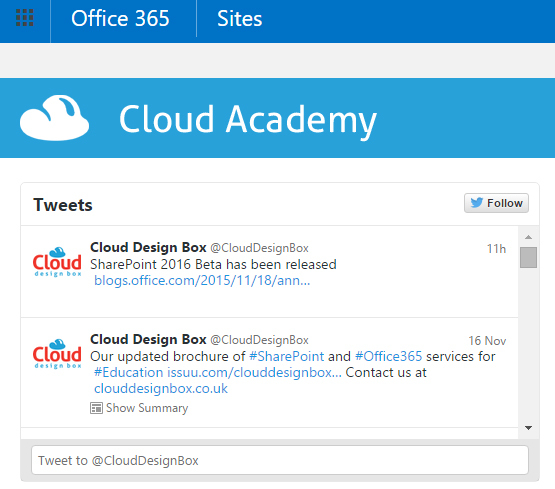 How to embed twitter feeds on SharePoint intranets and public sites has been a popular question recently so thought I would share with you how it is done. I’ve also created a video guide on YouTube to talk through the process. First login to your twitter account in a browser on a desktop computer (it doesn’t have to be the same account as the one that you want to display in your widget). 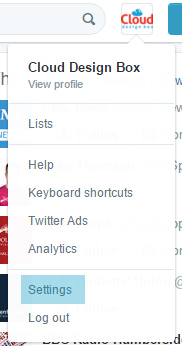 Click on your profile picture in the top right of the screen and select “Settings” from the drop down menu. Select “Widgets” from the left side menu. Choose your design and configuration. 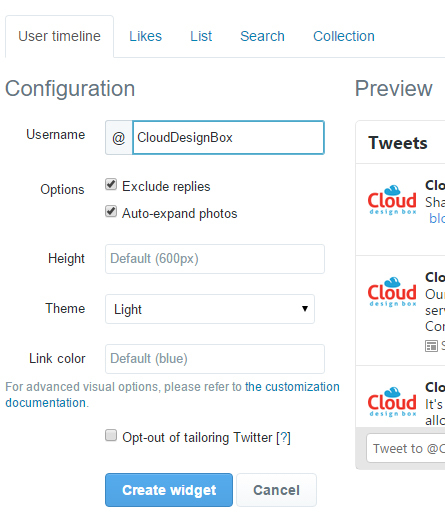 More options are available via the customisation documentation link on the page. Click “Create Widget” to generate the code. Copy and paste the code into a Script Editor web part. The Script Editor web part can be found under the “Media and Content” category. I go through the process in more detail in the video below. Hope you find it useful. For SharePoint support and consultancy please contact me at Cloud Design Box. This blog post is a bit more technical than my previous entries. Just recently, I was required to show two different views of a list on the same page (both styled with JS Display Templates). It’s relatively straight forward when you know how to quickly get the view GUID from the web part. You may have seen in other posts that you can get the GUID of a view by going to the edit view page and grabbing it from the URL encoded string. However this doesn’t always work for web parts added to the page as they tend to get thier own unique “current view”. //Override the BaseViewID if it's the one we want. For more information or an online demo, contact me by clicking here.